*** What great event will take place at the coming of Christ? “For the Lord Himself shall descend from heaven with a shout, with the voice of the archangel, and with the trump of God; and the dead in Christ shall rise first; then we which are alive and remain shall be caught up together with them in the clouds, to meet the Lord in the air.” 1 Thess. 4:16, 17. *** Where will the saints then be taken? “In My Father’s house are many mansions; if it were not so, I would have told you. I go to prepare a place for you. And if I go and prepare a place for you, I will come again, and receive you unto Myself.” John 14:2, 3. *** In what condition will the earth be after the coming of Christ? “I beheld the earth, and lo, it was without form, and void; and the heavens and they had no light.” “I beheld, and, lo, the fruitful place was a wilderness, and all the cities thereof were broken down at the presence of the Lord, and by His fierce anger.” Jer. 4:23, 26 (Isa. 24:1-3). *** Will any man be living on the earth at that time? “I beheld, and, lo, there was no man, and all the birds of the heavens were fled.” Jer. 4:25 (Zeph. 1:3). *** What is to become of those who are not caught up to heaven with the Lord? “The Lord hath a controversy with the nations; He will plead with all flesh; He will give them that are wicked to the sword, saith the Lord.” Jer. 25:31 (2 Thess. 1:7, 8). *** How long will these resurrected saints reign with Christ in heaven? “And I saw thrones, and they sat upon them, and judgment was given unto them: and I saw the souls of them that were beheaded for the witness of Jesus, and for the word of God, and which had not worshiped the beast, neither his image, neither had received his mark upon their foreheads, or in their hands; and they lived and reigned with Christ a thousand years.” Rev. 20:4. *** When were these made to live? *** How long will the wicked remain in their graves? “But the rest of the dead lived not again until the thou- sand years were finished.” Rev. 20:5. *** What will be Satan’s condition during the thousand years? “And He laid hold on the dragon, that old serpent, which is the Devil, and Satan, and bound him a thousand years.” Rev. 20:2. *** Where will he be kept? “And cast him into the bottomless pit, and shut him up, and set a seal upon him.” Rev 20:3. *** Where is the bottomless pit? “And he opened the bottomless pit; and there arose a smoke out of the pit, as the smoke of a great furnace; and the sun and the air were darkened by reason of the smoke of the pit.” Rev. 9:2. 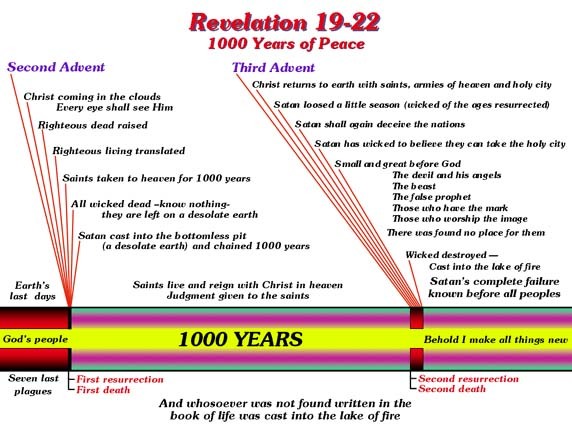 *** What is Satan’s occupation up to the time of his binding? *** In what sense are we to understand the binding of Satan? The saints are taken to heaven at the coming of Christ, and the wicked fall dead at His presence, to remain thus during the thousand years. Satan’s occupation is gone; there is nothing left for him to do but to wander over the desolate earth, and view the terrible work of which he is the author. There is now no one for him to tempt, and he is therefore bound in his operations. *** What will release Satan from this condition? “But the rest of the dead lived not again until the thousand years were finished.” “And when the thousand years are expired, Satan shall be loosed out of his prison.” Rev. 20:5, 7. *** For how long a period will he be loosed? “That he should deceive the nations no more, till the thousand years should be fulfilled: and after that he must be loosed a little season.” Rev. 20:3. *** In what work will he immediately engage? “And shall go out to deceive the nations which are in the four quarters of the earth, Gog and Magog, to gather them together to battle, the number of whom is as the sand of the sea.” Rev. 20:8. *** What will be the result of their effort to take the city? “And they went up on the breadth of the earth, and compassed the camp of the saints about, and the beloved city: and fire came down from God out of heaven, and devoured them.” Rev. 20:9. *** What statement will thus be fulfilled? *** How many will escape this second death? “Blessed and holy is he that hath part in the first resurrection: on such the second death hath no power.” Rev. 20:6. *** What will be the effect of the fire? “For, behold, the day cometh, that shall burn as an oven, and all the proud, yea, and all that do wickedly, shall be stubble: and the day that cometh shall burn them up, saith the Lord of hosts, that it shall leave them neither root nor branch.” Mal. 4:1. *** What, besides the wicked, will feel the effect of this fire? “But the heavens [atmosphere heavens] and the earth, which are now, by the same word are kept in store, reserved unto fire against the day of judgment and perdition of ungodly men.” 2 Peter 3:7. *** What will be the result? “And the elements shall melt with fervent heat, the earth also; and the works that are therein shall be burned up.” 2 Peter 3:10. *** Then what will come? “Never the less we, according to His promise, look for new heavens and a new earth, wherein dwelleth righteousness.” 2 Peter 3:13. *** Who will inherit the new earth? “For evil doers shall be cut off; but those that wait upon the Lord, they shall inherit the earth.” Ps. 37:9. *** What will be their condition there? *** How will every intelligent creature in the universe then show his appreciation of the gift of eternal life? *** We live in the last days of history. The end of life as men now know it is nearly ended. Soon Jesus will return. We only have one period of probation and that is during our present life. The Millennium will not be a thousand years of glory and peace here on earth. And it will not be an age of technological progress or a “second chance” for the wicked. All mankind will not be converted before it, during it, or after it. And neither Christ nor His redeemed ones will be on the earth during that thousand years. 1. Jesus is going to return for His people: He promised us that He would (John 14:1-3), and so we can know that He will. (a) He will come so that all alive on the earth at that time can see Him return (Rev.1:7; Acts 1:9; Matt. 24:30, 23, 27). (b) He will come so all can hear Him as He returns (Matt. 24:31; 1 Thess. 4:16). (c) He will come in immense glory, that of His own and the millions of angels that will come with Him (Luke 9:26; Matt. 28:2-4; Matt. 25:31; Rev. 6:14-17). (d) He will come unexpectedly (Matt. 24:44; 24:36). (a) He will raise the righteous dead (1 Thess. 4:16). (b) He will catch up the righteous living together with the resurrected righteous dead-to meet Him in the clouds (1 Thess. 4:17). (c) He will change their vile bodies to be like unto His glorious body (Phil. 3:20-21) and translate them (1 Cor. 15:51-55; Isa. 25:9). (d) Having gathered all the righteous (1 Thess. 4:17-18; Matt. 25:34-40; 24:30, 31), He will take His redeemed ones to heaven (John 14:1-3; 17:24; 1 Thess. 4:16-18). (e) He will destroy the living wicked with the brightness of His coming (Luke 17:26-30; 2 Thess. 2:8). (f) He will bind Satan to this earth (Rev. 20:2, 3). 4. During the Millennium, the earth will be desolate (Rev. 20:3; Jer 4:23-26; Isa. 24:1, 3), the wicked are dead (2 Thess. 2:8), there is no man left (Isa. 24:20-22; Jer 4:25, 26; 25:31-33), Satan is bound on a desolate earth (Rev. 20:1-3), and the righteous are in heaven (Rev. 20:4, 6; Dan. 7:22) engaged in a work of judgment (Rev. 20:4; 1 Cor. 6:1-3; Acts 24:25; Jude 6). 5. At the close of the Millennium, the Holy City descends from heaven (Rev. 20:9; 21:1-5; Zech. 14:4, 9); the wicked are raised, the “second resurrection” (Rev. 20:5, first part), and Satan is thus loosed to deceive them again (Rev. 20:7-8); Satan and the wicked surround the City to take it (Rev. 20:8, 9); all of the wicked are destroyed (Rev. 20:9), and this earth is made new (Rev. 20:1-5; 2 Pet. 3:10-14).